Windmill inking problem. Disappearing Ascenders and points on Lover Cases. Tonight I stuck on really strange and interesting problem. Check out attached image(bigger image you can see here http://cl.ly/image/0d2n1z3F0P0Z). I came across the BriarPress forum and found that some printers meets similar problem and solves it by reproducing photopolymer printing forms. I tried lot of polymer plate production modes, I have reproduced printing forms on different photopolymer materials (BASF ant Toyobo, Steel as well polyester backed and now I really know that this is Windmill inking problem because inking is perfect when I use same printing forms on proof press (KORREX). - 2 Heidelberg Windmills - same problem. - Tried on different printing speed. - Room temperature 20-22 by Celsius. Outside temperature 0 by Celsius. - High of inking rollers is perfect. - Skip feed (double inking) improves inking and Ascenders covers better. Hope somebody had such problem and will share their experience how to solve it. if I were you i’d try lowering your rollers just a whisker, the beauty of the windmill is you can adjust your rollers easily and accurately. Also, if your rails are not kept clean you will have all kinds of inking problems. - Roller trucks are cleaned. - I tried to lower rollers as well, but that is not solution, because to low rollers stain all form during the inking. The rails that the trucks run on have to be free of ink and oil or you won’t get a good print, you are right, your rollers should not ink the back ground of the plate. Another thing is your rollers, are they new or old? once in a while i deglaze mine just like you would do on an offset press. Rollers are quite new, with clear mat surface. New original trucks with same diameter. Make sure your poly is stuck uniformly and there are no air voids at all (bubbles) . Turn your rollers over 180o and try agian with no alterations to packings or settings . 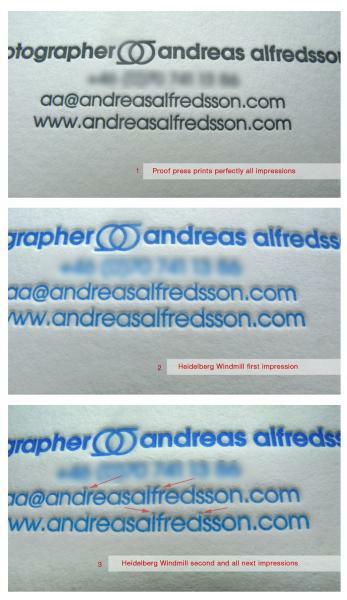 If the problem persists in the same place its roller height or you could be poorly washed out ,careful hand inking and close inspection may reveal this .normally a problem will show variations in an area but not perfectly identical every print ,you need to find that out before you can shoot along to the next test . Is it my eyes, or are you hitting the sheet much harder on the Heidelberg? What happens when you back off on the impression? Are the inking rollers rolling parallel to the type or perpendicular to the type? Was the proof and the Heidleberg the same way. It seems strange that if you lower the rollers you ink the back of the plate. It sounds like you were much too low to start with. You should have more leeway to lower it without nearly getting to the bottom of the plate. I had a similar problem, when increasing the impression the ends of type or the ends of trim marks faded after a few impressions and became worse as the run progressed. After weeks of head scratching the problem was resolved by replacing the lamps in the plate processor. I do not know how long they had been in but they had obviously exceeded their useful life. Hello! I had the same problem with my Heidy. Did you solve the problem? I will be grateful if you tell me. Thank you.